This is an eye-catching, conversation-starting, educational display that is also a form of social intervention. It disrupts people's normal routine and confronts them in a gripping and compelling way with the true conditions of women worldwide. The display consists of the chalk outlines of women's bodies as if they were killed in a crime scene. 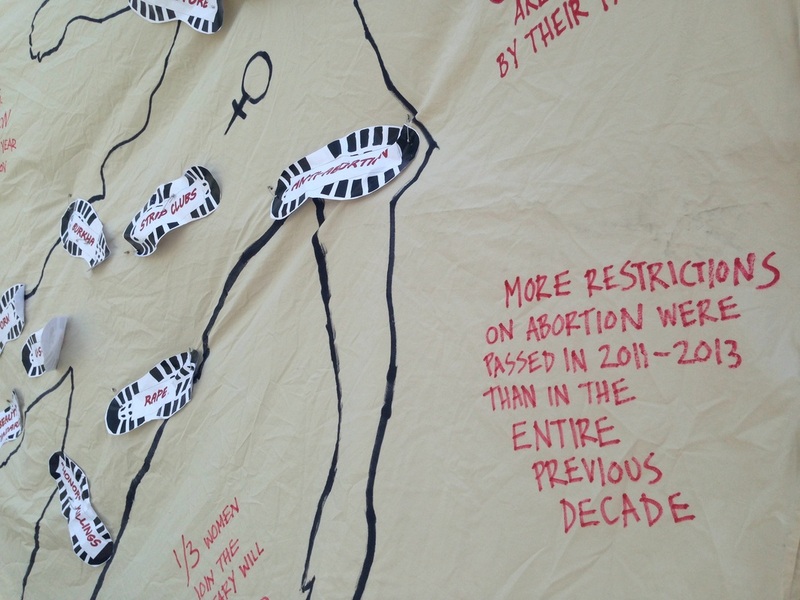 Across their “bodies” are the bootprints of various manifestations of patriarchy which symbolize not only the reasons that women are dying, but the utter disregard these social institutions and have for these women in their lives or their deaths. Around the border of the display are numerous facts about the level of violence, disrespect and degradation that women face in every sphere; almost no one knows of these things and everyone needs to know. This display gets people's attention and draws them in. Bring it to the main walk on a campus, set it up at outdoor concerts during the summer, take it to sporting events, set it up outside museums, near a transportation hub, in a neighborhood, or anywhere else that there is foot traffic. As people walk by, ask them to take a moment and look at the display. When they are looking, give them space to read and “take it in.” After a while, ask them what they think of what they are reading. What strikes them the most? Are there things they didn't know? Things they are surprised by? Other things they think should be on the display? Listen to what they have to say and do your best to answer their questions or argue with them if you think they are wrong about important matters. Don't let your arguments get personal and don't waste your time on people who want to make it personal. This display concentrates the brutal reality of women's lives across this planet, everything you say should keep people coming back to that. Ask people to donate to Stop Patriarchy while you are out with this display. Also, have a clipboard handy to sign people up to Stop Patriarchy's email list and to give their phone numbers to stay connected. Send these lists in to StopPatriarchy@gmail.com and keep a copy to inform them of your next activities. Have copies of Stop Patriarchy's Call to Action to hand out to people who are interested. A print-out of our Frequently Asked Questions for your reference in handling questions that come up. A DONATION bucket. You can make this out of a coffee can or tissue box, tape paper that says “Stop Patriarchy Donations” on it (people are much more likely to give if the donation box is clearly labeled). Now That You Have Everything, Get Out In a Public Place and Get Started! The best part is that you can assemble this in public – doing so draws people's attention and gets them involved all the way along. Tape the big sheet or paper down on the ground or put some weight on the edges so it doesn't blow away. Have one to three women lie down on the sheet in various poses. Trace their bodies, creating what looks like a “chalk outline” from a crime scene. Place the bootprints across the bodies using tape to secure them. Try to assemble them to form a trail. If you don't have enough people to draw all the “chalk outlines” at once, just have one person lay down to be traced multiple times. Also, try to figure out where all the bodies will fit before you trace your first one. Finally, send us pictures and a report! Don't forget to amplify everything you do by sending in pictures and a report for us to learn from and share with others who are taking up this fight and visiting this website from around the world.